Lexus has revealed the first pictures of its production-ready NX SUV ahead of its debut at the Beijing Motor Show on 20 April. 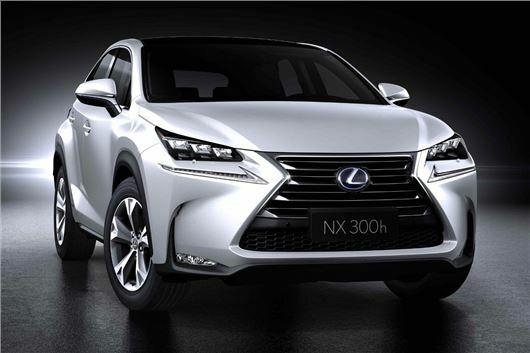 The NX sits below the RX in the Lexus range and will rival the likes of the Range Rover Evoque. Pricing should be competitive with other SUVs of similar size, starting at around £30,000 and sales will start at the end of 2014. The styling has been toned down compared to the original concept, which appeared at the 2013 Frankfurt Motor Show, but it retains the angular, aggressive lines. The wheel arches aren’t quite as wide as those on the concept but they’re still prominent and house 17-inch or 18-inch alloy wheels. One engine – the 300h hybrid – is familiar from the GS and IS ranges, but there are also 200t and 200 variants, the former of which is turbocharged. Engines are offered with a choice of front- or all-wheel drive, but it remains to be seen precisely which engines UK buyers will get. The cabin has a sports car like design, with a small wheel and high transmission tunnel and sculpted centre stack. The dashboard, doors tops and seats are trimmed in leather in the first pictures, but lower spec cars may have different materials. Technology includes a wireless charging tray for mobile phones, a touch-pad operated infotainment system, a head up display, blind spot assist and rear cross traffic alert to help with reversing out of a parking bay or drive. UK specifications are to be confirmed. Still ahead of Merc and Beemer. Thanks God there's no diesel!